I am the cello and I am known as the instrument that sounds like the human voice. The string quartet would not exist without me and my sound is sweet…but do you really know me ? My family: The double bass is my brother, and the violin and viola my little brothers. I have a large musical range from very high to very low notes. My strings vibrate when stroked by the bow (arco) or “ouch”, you pinch me to pluck the string (pizzicato). I am very good at music theory because I use the bass clef for low notes, the alto clef for the middle notes , and the treble clef for high notes. I can play as a soloist (I love to hear myself!). But I can also play duets with piano or guitar, or play in an ensemble with string or wind instruments, or in a chamber music formation, or in a symphony orchestra. I love baroque and classical music, but also jazz and folk. I am versatile and I often appear on TV ! Are you 3 years old, or 20 ? Age doesn’t matter. I am very kind and can adjust to your height and grow with you: 1/16, 1/10, 1/8, 1/4, 1/2, 3/4, and full size…! What do you think about that ? Come on, put me between your knees. Beware of my retractable end pin and be careful not to hurt your foot. The endpin helps to keep me steady. Your two hands support me; the right one holds the bow and the fingers of your left hand move on my strings. That’s it, you’ve created your first sound. It will improve, becoming beautiful, mellow and in tune. 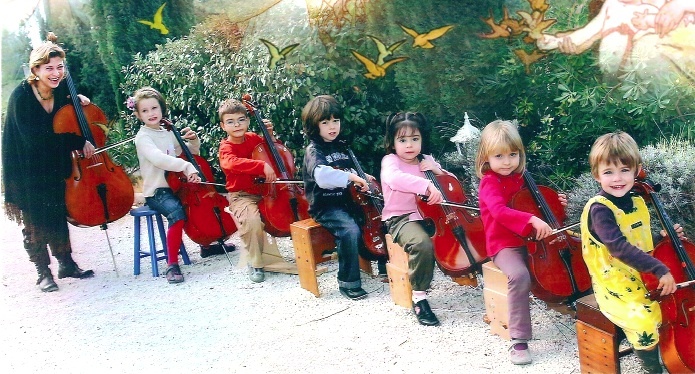 Now you need a Suzuki teacher who will teach you from the age of 2 or 3 to produce a clear sound and play in tune. Your fingers will gallop on my strings, and you will meet other instruments in groups of two, three, ten, or a hundred others in international concerts. What ? You haven’t yet enrolled with a Suzuki teacher in your area ? Hurry, we’re waiting for you !